Bison Stats: Bordowski 1+1, Cowley 1+1, Sampford 1+1, Klejna 0+1, Morris 0+1, Tait 0+1. Bees Stats: Antonov 1+0, Millner 0+1, Thompson 0+1. Mr Matthews took charge of this long-awaited home fixture, between our own Bison & the visiting Bees. Social media has been rife all week, with fans of both teams airing their views on the pending fixture. It certainly spiced up what was going to be an already, possibly explosive meeting. Whose fans would be celebrating at the end of the game though? There was a slight delay, before a puck had even been dropped. A problem with one of the nets, but after a little time, this was all sorted. The game was only just over a minute old, before Bees took their first penalty. James Galazzi picking up an Interference call at 1.04, when he impeded Bison Captain, Russ Cowley at the side of the Bees net. Bees killed it off successfully, a few seconds later, Bees d-man Brendan Baird, flipped the puck over the glass, so received a Delay of Game call at 3.32. Again, Bees PK unit successfully killed off the penalty. Bison just couldn't get the Powerplay going. Bees almost took the lead, when Ed Knaggs shot from the point was spilled by Alex Mettam, but redeemed himself, with a good save from Shaun Thompson's follow up. It was then Bison's turn to be short-handed. Liam Morris received a Slashing call at 7.41. But again, both teams� PK units stood firm and Bison returned to full strength. Ben Paynter was next to take a visit to the penalty box, when he was called for Roughing at 10.17. As previous attempts, Bison just couldn't find the right pass for an opening to shoot on net & Bees killed off penalty. At 15.28 Bees import David Millner, was adjudged a Tripping call. This time Bison almost broke the deadlock, when Michal Klejna fired in a shot, which defected off Knaggs and hit the side of the post, but apart from that chance, Bees nettie Dean Skinns wouldn't be tested again. A little later, Bees would again fall foul of Mr Matthews, when Ryan Watt got called for Holding at 18.58. The final minute ran down and at the first interval, both teams were scoreless. Not the prettiest period of hockey. The shots on goal count was announced as, 6 on Bison & unbelievably, only 1 shot on the Bees net. The 2nd period started with Bison with 58secs still remaining of Watts penalty, but they would only need 43secs. Alex Sampford finding Liam Morris and he skated around the back of the net and laid off a pass in front of net, which saw an unmarked Richard Bordowski skate in and smash the puck home past Skinns to break the deadlock. Shaun Thompson was then called for Slashing at 21.49, but Bison couldn't add to the scoreline. Mr Matthews appeared to be taking quite a lot of backchat from a couple of Bees players and had even warned their bench about it. But one in particular just couldn't keep it shut and at 25.06, Ryan Watt had another outburst. This time, the ref had had enough and Watt was given an Abuse of Official penalty. The Bison powerplay again didn't provide much, but there was a chance for Alex Sampford, but his shot was saved by Skinns. As soon as Watts penalty had expired, he returned to the ice, but straight back into penalty trouble. He skated straight into a Bison player and appeared to throw a punch, so a Roughing call was forthcoming at 27.17. The Bison went on the one-man advantage again. Their PP were currently 1/6, but would soon become 2/7, when Bison MoM Russ Cowley coolly slotted home at 28.30. Michal Klejna picking out Ashley Tait, who fed Cowley and he skated in from a tight angle and managed to squeeze the puck past Skinns for 2-0. From the face-off, George Norcliffe was awarded a Roughing call and Bees went on the Powerplay. But Bison would get a glorious chance to add another. Liam Morris skating on to a loose puck and he was away off up the ice, with 2 Bees players in hot pursuit. He tried to stuff the puck in on the backhand, but Skinns closed the door. Then the Bison went another man down, as Coach Tait was given a Slashing call at 29.37. This gave Bees a lengthy two-man advantage, but the Bison PK units was clearing the puck at every opportunity and soon they were back to 4 skaters and then full strength, soon after. Bees would however finally get a goal back, at 34.22. Vanya Antonov, slotting home from close range, with assists from Millner & Thompson. Tensions were still very high and unfortunately it would boil over at 36.38, after Bees forward Josh Martin caught Mettam after the whistle. This riled up a couple of Bison players, mainly Liam Morris, who went after Martin and a couple of digs were exchanged between the players. Then with these two still in each other�s faces, Morris inexcusably, appeared to headbutt Martins visor. Martin overreacted like a foreign footballer, but amazingly, jumped back on his feet and now incensed, went after Morris. Martin appeared to manhandle the linesman to one side to get to Morris and they threw punches at each other, with both linos trying to smother both players and bring the game, which had had a bad undercurrent from the off, under control. Both players were despatched to their respective dressing rooms, but as Martin skated off, he took off his helmet and launched it back onto the ice and in the direction of the officials. It took quite a while for the ref to take, all what had just happened into account, consult with both linos and finally penalty announcements were forthcoming. Both players receiving 5 + Game for Fighting, but Morris, also picked up a Match penalty for the headbutt. Nothing for Martin for manhandling the linesman or even throwing his helmet onto the ice. This resulted in Bees going onto a 5min powerplay. Thankfully, Bees PP was not as potent as normal & Bison managed to see out the end of the period, with the scoreline - Bison 2 Bees 1. Bees started the 3rd period, still with 1.38 of Morris's major penalty to elapse. As at the end of the 2nd, Bison kept Bees chances to an absolute minimum and successfully killed off the remaining time. It wouldn�t be long though, before Bees found themselves back in the sinbin. This time Zack Milton, was called for Hooking at 42.42. Bison's PP had been stifled pretty much all evening. The puck was being passed around well, but it was becoming really difficult to find a good shooting lane & also Bees penalty killers were forechecking really well and this almost paid off for them. The Bison defence being put under pressure to move the puck at speed and a slight mistake was seized upon by Antonov. He stole the puck and with Malinik in close attendance, they created a 2-on-1. Thankfully, he elected to shoot instead of passing & Alex Mettam came up with a big save, to keep the Bison's slender lead still intact. Before Milton�s penalty had expired, Adam Jones went close. Bees killed off the penalty and set about trying to get the goal that would level the scores. Michal Klejna was next to go close, as he charged down a shot and wheeled away up ice. As he got into the Bees zone, he let rip with a slapshot, but it was high & handsome and the puck flew around the boards. Bison kept frustrating Bees attacks and bringing the puck forward to try and increase their lead. At 48.08, a sweet move involving Bordowski and Cowley, set up Alex Sampford in front of net and he despatched the puck behind Skinns, to give Bison that little bit extra breathing space on the scoreboard. A few seconds after the restart, Danny Ingoldsby was awarded a Tripping call at 48.41. Bison stood firm and again the penalty was nullified and they returned to full strength. Time was moving on and we were now entering the final 5mins. Bees now facing a slightly bigger hill to climb, were getting themselves into trouble in their own zone. A slack pass was intercepted by Sampford and Alex got his shot off, but Skinns got a glove on it and the puck went to safety. Now under 4mins to go and Bees kept coming forward, trying to get themselves back into the game, but every time, Bison dealt with whatever was thrown at them. Under 3mins, then we entered the final 2 minutes of the game. 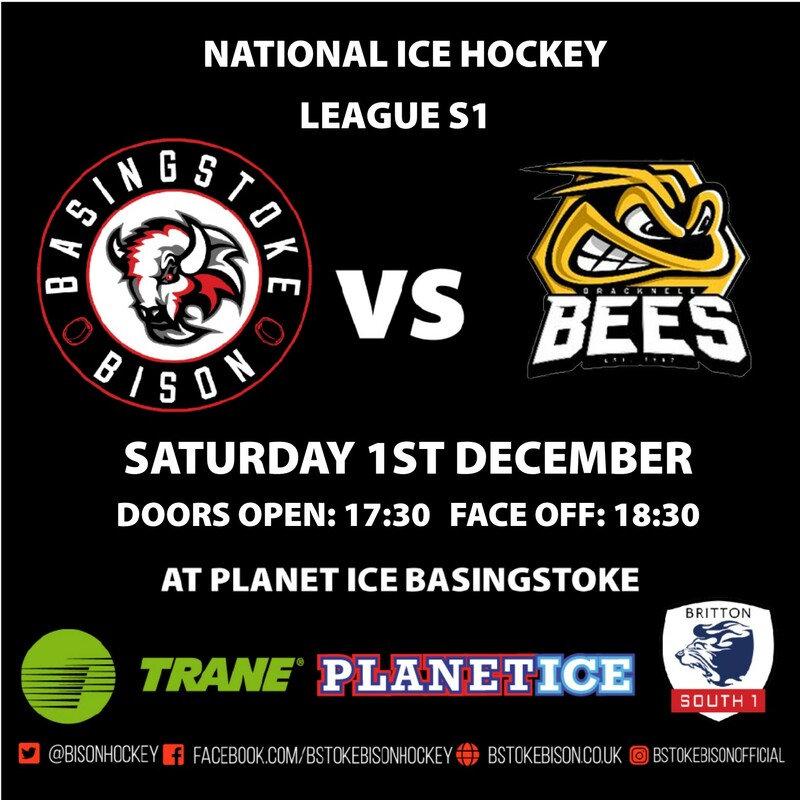 Bees pulled Skinns in favour of the extra skater and set about trying to nick a goal and put Bison under more pressure. But again, like most of the evening, every Bison player was doing his job and limiting the chances Bees had. With the net empty, Klejna took a pop at it, but Stuart Mogg was the last line of defence and stopped the puck entering the net. Under a minute now, then 30 secs, then the last 10secs ran down and Bison had sealed an excellent result, against one of their closest rivals in the table. Also pleasing was that with our games in hand on a couple of the teams above us, the win was almost like a 4 pointer. The Bison fans were ecstatic with the result and quite frankly, they have been (as normal), immense supporting the guys. The sound levels on match-nights are incredible and away support is certainly improving too. Great job every one! !